Last week we published our blog post called “Types of Event Seating Arrangement And Layout“. This week, we include more types of event layout and seating arrangements. Horse-shoe layout is in a rounded-U shape. There are only chairs placed in the horse-shoe shape with no tables. It is usually used for bigger groups. Oval style is just like the horse-shoe, where there are only chairs but it is arranged in the shape of an oval. This setting consists of two rows of tables, arranged in a V-like shape, if you are looking at it from the back of the room. 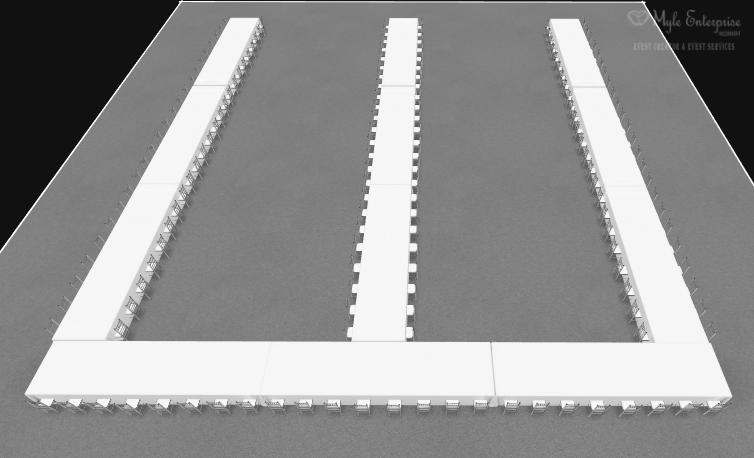 There is a row of table on the left and a row of table on the right, with sufficient space for people to walk in between the two rows, to get to the front of the room. There is usually a speaker, presentation or program going on at the front of the room. Herringbone setting is rows of tables and chairs but inverted inwards in the middle of the room. Imagine fish bones but without the centre bone. It is like classroom style except the rows of tables and chairs are placed like arrow shape, if you are looking at it from the front of the room. Theatre style is where there are rows of chairs all facing towards the front of the room, where there is usually a stage area with speaker, presentation or performance going on. It is like the layout you see in the cinema or performance hall. There should be sufficient space for guests to slide in between the rows of chairs to get to their seat. There are walking spaces in between the columns containing rows of chairs. Cocktail setting is where guests are all standing. Most of the time, cocktail tables (high tables) are placed at the event venue and sometimes, no tables and chairs at all. Guests can easily mingle and speak to other guests. Drinks are usually served and the type of food served for the guests’ convenience of eating would be cocktail-style food like finger food. It is advisable not to serve food that would require guests to use their fork and knife to cut as that would result in the rocking of the cocktail table. Top table and sprigs layout. Top table and sprigs are commonly used in the western countries, especially in the United Kingdom. It is usually for more formal occassions. The table where it is referred to as “top table” is where the host and the important guests are seated. Sprig refers to the tables that are lined in front of the top table. The word ‘sprig’ means a small twig or stem with leaves or flowers on it. The line up of the tables and chairs resemble sprigs. Some of the pictures on the seating arrangements above were created using AllSeated.com. 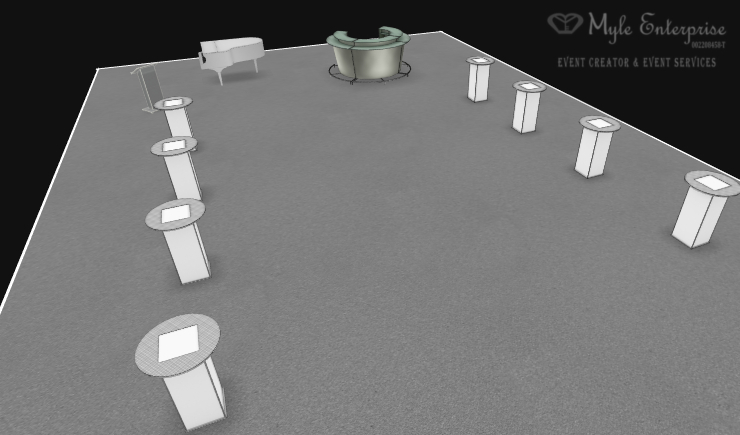 There are many types of event layout that you can use for your event and you can even create your own layout. At the end of the day, what is important is that your layout allows your guests to move about and also be seated comfortably without getting blocked or knocked into. Imagine if you are standing and holding a drink while chatting with another guest at an event, then someone knocks into you because the tables were placed too close together and there is no place for guests to walk around. You would not like that. Another example of layout not well thought of is tables and chairs placed too close together that when you are seated, the chair behind is touching your chair. Then when you want to get up and push your chair behind, you can knock the person sitting on the chair behind and have him cup his/her face into the soup bowl. Now, we would not want that to happen. So just use some common sense when it comes to creating your layout for your event. When you are planning an event, you would need to consider the different types of layout for your tables and chairs. Here are some common types of settings for the event area or room layout. Round tables are commonly used with chairs placed all around the table. Usual number of chairs are 8, 10 or 12 chairs per table. Cabaret style where the chairs are placed on one half of the table only so that all guests are facing the front of the room. Round tables are used and the chairs are placed around half of the table where those who are seating on the chair will be facing the stage. This style is useful when you have a presentation or stage performance, so everyone seated can face the stage and watch. One rectangular shaped table is used for boardroom style meetings. Chairs are placed along both the longer sides of the table. The person chairing the meeting will usually sit on one end of the shorter part of the table. Sometimes there is another seat placed at the other end of the shorter part of the table. All the guests attending the boardroom meeting will be able to see each other at the table. This square table setting has a hollow centre. It is usually set up using smaller square or rectangular tables, joined up together to form a square shape. Chairs are placed along the outer part of the square, with the guests seated facing towards the hollow part so that they can look at each other. Square or rectangle tables are joined together to form a squarish U-shape setting. It is like the hollow square except tables on one side of the hollow square are removed. This layout would be useful if there is presentation at the event and all the guests can look at the focal point. This layout also allows the speaker or presenter to easily approach everyone seated from inside the ‘U’. Classroom layout is where tables are placed in rows with chairs so that people can sit on the chairs to use the table. Commonly it is set with a walking space in the middle of the room, with rows of tables and chairs on the left and right. Organising an event is not an easy task and requires a lot of attention to details. It is not rocket science as well and it is mostly common sense. You can add a lot of elements into the event especially if you have an unlimited budget. Today, we are going to look into the process of organising a simple private party. Private parties are by invitation only and are usually celebrated with people whom you know for example birthday parties, wedding anniversaries, bachelor parties, bachelorette parties or hen nights as it is fondly known in some countries and many more. People can be celebrating anything and everything from welcoming family members back to their hometown to throwing a party on their recent job promotion or saying farewell. Here are the steps to plan a party. Know what you are celebrating and if you want, you can choose a theme for the event. For example, you are throwing a housewarming party to celebrate your recent move to a new house. You can set the theme as “Mi kasa, su kasa” which literally means “My house, your house” in Spanish and have your event setting revolving around items and decoration commonly found in Spain. The saying “mi kasa, su kasa” is also a from of greeting to make your guests feel comfortable and at home but let’s hope that your guests do not go overboard with your hospitality and really start to treat your house like their own home. Decide the date and time of your event. After that, determine the number of guests you will be having at your event. You can consider whether you would want to hold the party at your home or out of your home. The venue would need to be able to accommodate the number of guests you are having at your event. Next, you decide on whether you want to provide food and beverages at your party. If your answer is yes, then you can consider cooking the food on your own or to hire caterers. You get to show off your amazing cooking skills and save some cost if you cook your own food but it can be time consuming, which you need to factor in the time in your planning schedule. Hiring caterers can save your time to prepare and cook the food, especially if you have a huge amount of guests plus the caterers would serve their food and beverages in professional serving dishes. 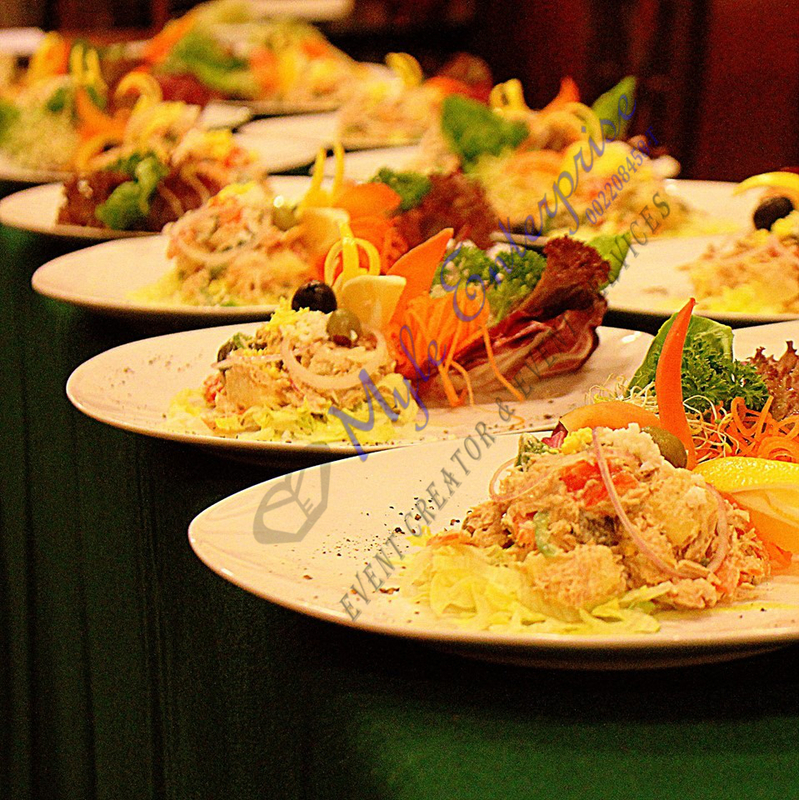 Most caterers also have tableware such as cutleries, plates, bowls and glasses which you can rent at a separate cost. Another option on food and beverages is taking away from restaurants or ordering deliveries but you will need your own tableware. 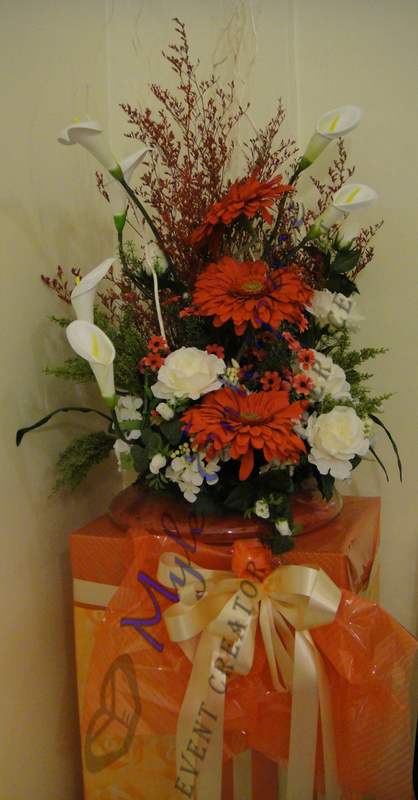 You can then invite your guests and remember to include the details of your event. 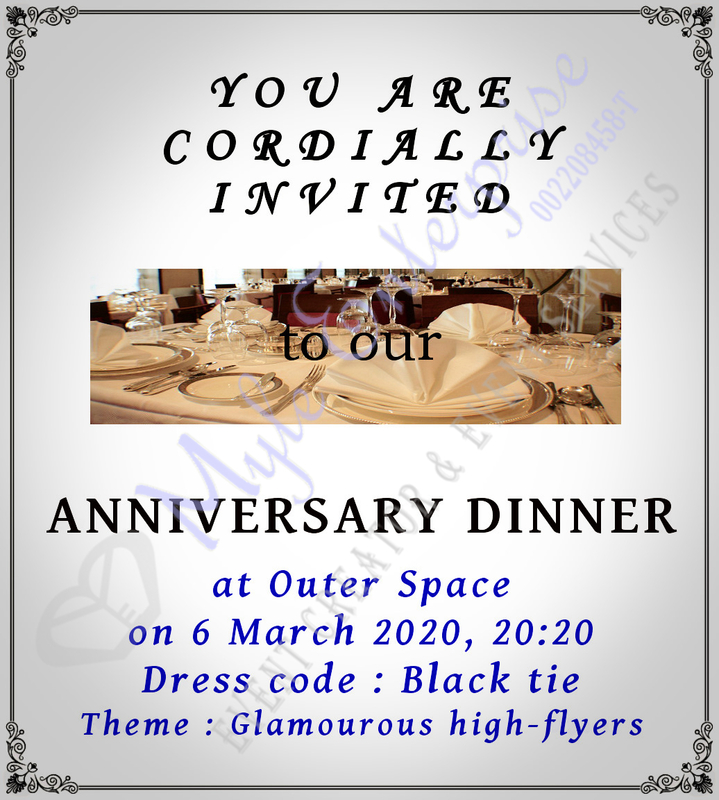 It would be good to set a dress code so that your guests know what to wear and what to expect of the party mood setting. If you have the budget, you can include some decoration to make the party venue look more attractive. Even if you do not have the budget for decoration, you will still need to think of the set up for the party venue. You will need to consider if there are proper space and pathways for guests to navigate their way around the venue; whether you need chairs and tables. If you are holding the party at your own home, then you need to think of whether you will need to rearrange some furniture to accommodate the guests. You would not want your lounge chair to be blocking half the entrance to your home and some random flower decoration in a huge vase brushing your guests’ faces every time they pass by the hallway to get their drinks. These are the basic steps to organising a simple party. Have fun during your party and at the end of your event, there is always the clearing up of the venue and cleaning up part to take care of. Of course, it will be much easier to hire an event organiser to take care of all these for you. You can just leave it to the event organiser to plan your party and manage it for you while you sit back and relax. At Myle Enterprise, we can organise private parties for you and we focus mainly on adult social events.